The same way English speakers from London use some words differently from those in New York or Sidney, there are very common expressions and vocabulary in Spain or Mexico which would be completely new and somehow strange for a Spanish native from Peru or Guatemala. If you are studying Spanish in Mexico, you will learn some words never used in Spain. But, remember, you are learning the Spanish language, which includes how to conjugate verbs, how to build sentences, the use of masculine and feminine genders, and general grammar rules among other things. So, all those differences among countries/regions are relatively minor. And the knowledge of Standard Spanish will help you communicate with any Spanish speaker in the world despite some terms which are original in every Spanish speaking country or region. That is why someone from Argentina will be able to have a conversation with someone from Bolivia, and both will understand each other fairly well. Every language experiences a continuous evolution; we are talking about living languages! The Spanish language has evolved in America thanks to lots of terms from native indigenous languages spoken in every region and country. We are talking about the influence of native languages not just in the Spanish language but also in culture and customs. In this case, the evolution includes, among others, the influence of terms belonging first to the indigenous people living there before Spanish speakers arrived at the new continent. Those terms have become Spanish words in those countries. Terms like 'aguacate' and 'palta' ('avocado' in English) are respectively used in Mexico/Spain and Chile. Both terms have American indigenous origins. The same thing happens with what we call in Spain 'palomitas de maíz' (popcorn). In Chile, they use the term 'cabritas de maíz', and in Colombia they say 'tote'. In Mexico and Spain, the most common term for 'car' is: '(el) coche, but, in the Caribbean areas, they use '(el) carro'. The words for ''glasses' used in Latin America are '(los) anteojos' and '(las) lentes', in contrast with the word used in Spain: '(las) gafas'. The word: 'computer', has a lot to do with the word used in Latin America: '(la) computadora'. On the other hand, in Spain the common usage is '(el) ordenador'. If you want to eat a peach, you will have to ask for a 'melocotón' in Spain, or a 'durazno' in Latin America. For the English word (TV) 'remote', we have, in Latin America, the term '(el) control remoto' and in Spain '(el) mando a distancia'. And what about 'la guagua'? This is a very interesting term: It means 'bus' In Cuba, Puerto Rico, and the Canary Islands in Spain. But in the Dominican Republic they use this word to refer to a car. In Ecuador 'guagua' means 'little boy'. And according to a reader from Chile, there 'guagua' means 'baby'. The term 'concha' means 'shell' in Spain but in Argentina means something very different: It refers to a woman's birth canal. In the same way, we have another word–very common not just in Spain, but in several Spanish-speaking countries: The verb 'coger' ('to catch', 'to grab'). 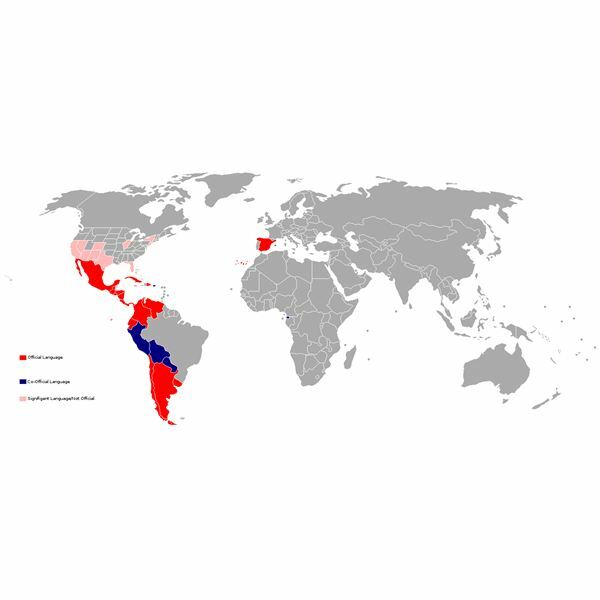 In Argentina, Honduras and other countries in Latin America its meaning changes significantly: 'coger' means 'to copulate', but in a very rude way! Spanish variations among regions of Spain and throughout Spanish-speaking America, from Citizendium.org.